Let me share with you a small personal tryst with investment in Equity-linked Savings Scheme (ELSS) for tax-saving purposes. Since I track stock markets closely, my preference is usually tilted towards direct equity investments rather than going through the mutual fund route. However, in order to stifle my taxable income, I had to invest Rs. 30,000 in an ELSS scheme way back in Feb-2008. The Indian markets were in the midst of a severe bear phase then, with Sensex hovering around 16000 levels. The time ticked by and it was Feb-2009 on the calendar. It was time to invest another Rs. 30,000 to save on taxes. The Sensex was quoting at paltry 8000 levels – on hindsight, it turned out to be the trough of the bear market. Needless to say, there was panic written all over the screen. Fortunately, for me, this period turned out to be a golden opportunity to average my previous lump-sump investment which went in at higher levels of market. The average value of my total Rs. 60,000 investments now stood correlated with Sensex 12000 levels. But, you might not be lucky enough to get such averaging opportunities just around the end of every financial year. Your lump-sump investments may not necessarily stand you in sweet spot if your investments are made arbitrarily during the year-end. They need to be planned well in advance through out the year. Plan your tax-saving instruments – don’t leave it for the last hour. Even tax-saving investments can be routed through systematic plans. Most of the tax-saving investments are for minimum of 3 years. Determine which investment option to save taxes suits you the best. Investments with mere intention of saving taxes might backfire on you. It’s that time of the year when most of the individuals are found scrambling to invest in tax-saving instruments just before the financial year-end. Currently, Section 80C of the Income Tax Act allows deduction of upto Rs.1 lakh from the gross total income. Plus another Rs. 20,000 for investments in infrastructure bonds if this Rs.1 lakh limit is exhausted. Public Provident Fund, or PPF, is a long-term, statutory scheme of the Central GOI. Currently, the interest rate offered through government-backed small savings scheme is around 8%, which is compounded annually. On maturity, you pay absolutely no tax under Section 80C. This long-term scheme is for 15 years; hence if your investment horizon is short-term in nature, PPF is not meant for you as it locks your liquidity for a relatively long period of time. In this scheme, you need to invest a minimum deposit of Rs.500 and upto maximum of Rs.70,000 in a financial. Unit-linked Insurance Plans (ULIPs), which are eligible for Section 80C tax rebate, areinvestment products that provide dual benefits of life insurance and savings element as a one stop solution for an individual’s financial goal. However, if you don’t need insurance, going with ULIP is not the best investment bet on the horizon. Recently, insurance regulator IRDA had initiated a few corrective measures by hiking the threshold limit for ULIPs from 3 years to 5 years of lock-in period and mandated a minimum guarantee for such plans. Now, the policyholders can also opt for pre-mature exit without any penalty. Equity-linked Savings Scheme (ELSS)is mutual funds that help you save taxes under Section 80C as well as generate decent long-term returns from the equity markets. Such schemes are typically characterized by a three-year lock-in period. However, the tax benefits of ELSS will be phased out with the introduction of the Direct Tax Code (DTC) starting from April 1, 2012. But, the revised code mandates that existing ELSS funds will be able to claim tax-exemptions. So, this might just be your last opportunity to put money is lucrative tax-saving mutual funds. You might be thinking how come bank fixed deposits are included in tax-saving schemes? Since 2006, Bank Term Deposits which are of over 5 years tenure and upto Rs.1 lakh are allowed exemption under Section 80C of the Income Tax Act, 1961. Such deposits should necessarily be in the RBI mentioned list of Scheduled Banks. Most of such tax-saving fixed deposit avenues are of fixed tenure and do not allow pre-mature withdrawal facility. Further, such term deposits can not be pledged to secure a loan. Most importantly, the biggest drawback of this scheme is that the interest for the amount deposited is taxable. Salaried individuals are compulsorily required to contribute 12% of the sum of basic pay and dearness allowance to Employee’s Provident Fund (EPF). This sum is deducted by the employers from the monthly payroll of employees as a social security scheme akin to a forced-saving towards retirement planning. EPF brings with it key benefits as a fixed-income instrument providing tax benefits under Section 80C at the time of investment. Even the returns from EPF are tax free on maturity. The employer also has to make a matching contribution to the EPF. The 8% returns from National Savings Certificate (NSC) are not only assured and tax exempt under Section 80C, but also government guaranteed. Unlike PPF, NSCs have no upper limit on the maximum amount that can be invested in a fiscal year. This small saving scheme offers tax-free initial deposit for 6 years. However, interest in NSC is taxable. But, the interest for the first 5 years is eligible for a deduction as NSC is a cumulative scheme – where interest is reinvested and is qualified under fresh deduction in NSC. In Union Budget 2010, Finance Minister Pranab Mukherjee proposed the deduction for funds flowing in long-term infrastructure bonds in India upto Rs.20,000 under Section 80 CCF of the IT Act, 1961. These bonds issued by RBI-notified entities carry long tenures of 5-10 years for facilitating investment in infrastructure projects within the country. The interest earned can vary from 7.5% to 8.5% depending upon the issuer and investment option chosen. For the investors at highest tax bracket, such investments can bring in savings of upto around Rs. 6000. You can claim tax benefits for the health insurance premiums to the extent of Rs. 15000 under Section 80D. Moreover, you can also claim an equal amount of deduction for buying medical policies for your parents. Any amount paid towards life insurance premium for yourself or your family is eligible for tax break under Section 80C. If you’re paying tuition fees for your children’s full-time education, you are eligible for tax deduction under Section 80C. Mind you, the said tax benefit is not for the donations paid to such institutions. Are you still waiting for the last week of March to invest your taxable income? 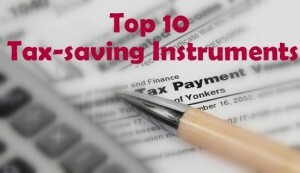 "Top 10 Tax-saving Instruments for Investors! ", 5 out of 5 based on 1 ratings. Nokia X2-01 – Cheapest Smartphone by Nokia.. Will it succeed? Is PPF+EPF a gud option ? Till now I dint plan for any savings. for the first time I am searching sites which would suggest me to save some money and gets accumulated with good interest. I had gone through Postoffice schemes, LIC policies, but not much aware of Banks. would like to get some knowledge on the Mutual funds / stock markets. my brother has not paid income tax for last 2-3 year, in this period he was not earned any thing above Rs. one lakh, now he stated earning from this year and may get 10-12 lakh. He has not applied for ITR for last 2-3 year. please let me know how he can apply for income tax return this year. I have earned Rs 4.50 lakh per year on salary and have saved Rs 1,00,000/- in my EPF. Now please suggest to me how can i save in other field except EPF, which is also tax free. May be this can help you in a better way… If you are looking for some tax saving schemes or plans You should visit http://bit.ly/yU0S2Q or Call India’s 1st financial helpline at 60011600………. Q: sir we both are employees. I wants to put savings of my wife under 80c which is paid by me. AM I ELIGIBLE OR NOT? Returns from insurance will hardly beat inflation. No Insurance policy can make you richer than what you are today. ( even on maturity ) . For Application of tax Savings Mutual Fund – Contact – Amit Surpuriya – 9850873688 – Pune. HOW MUCH SAFE ULIP FOR TAX SAVING? Check for ULIP charges thrhgly.. Investing in IFCI Infrastructure Bonds is also an option available, and this investment avenue helps in nation building. are donations paid to political parties tax saving instruments? very use full information share. 80 CCF bonds are widely used as an instrument for tax savings these days. Just by investing 20K you save 6K odd tax plus you get 9% odd interest rate. So proves to be a decent bet! Very true, a saving of Rs.6k on an investment of Rs.20k is too good a lure for investors. But then, there is a small caveat over here too… you save Rs.6k only if your income falls in the highest tax bracket of 30%. Suppose, one’s income falls in 10% tax bracket, the tax saving sums up to Rs.2k only. Its best for the people whos income fall in 30% tax bracket..
How do we can save taxes ? Great information but how do we will get the National Savings Certificate ? I have cherished every post of yours but one point in this post disturbs me. ULIP is the most dangerous financial instrument invented by the insurance companies ever. They combine insurance and investment which are very two different things altogether. Ask any good financial analyst his frank opinion about ULIPs and listen to what he says. ULIP is sold frantically because the agent receives a good sum to sell it. Take a look at how much exact amount is invested into the equities and into insurance premiums and how much is exactly cut in the name of fees. It's fees are horrible and returns are again subject to market risk? Can you point out just one benefit of investing say 1 lakh into ULIP Vs investing 1 lakh in pure term insurance + Mutual Funds separately? I request you to analyze ULIPs thoroughly and when convinced please remove it from the list. Sorry for a late reply on this one – In principle I fully agree with you and personally I subscribe to the same view. Viral Dholakia, one of our editors has written this post and I will leave it upto him to answer your query! Having said that, I should point out that ULIP has benefited a lot because people who would not have generally put in money for insurance, have done so just because they see the returns in it…. It is a very cleverly thought out product by companies who make hell lot of money on it…and now the SEBI & others have come down heavily on ULIPs..
Bottom line is lot more have got insured because of ULIPs…but from investment perspective it is not a wise investment..I agree..
And, yeah… Madhav, thanks for the accolades. Wanted to write much more on this very topic of tax-implications. But, the article was getting a bit too long. So, decided to cut short and be informative. Hip Hip Hurray! Another great post by Viral. 1. Payment towards Term insurance policies may not be tax deductible – need to check. 2. I am not sure how taxing for NRI’s works and so also tax-deductability. Payment of premiums towards Term Insurance policies is a basic Life-insurance product. It should, ideally, be tax deductible. Premiums towards any basic Life-insurance product is tax deductible. Term Insurance is also one of the basic Life-insurance product (rather it is a pure Life insurance Product) and it is Tax-deductible. I do not know much about Insurance issue. I know a little about NRI income taxability. As far as I know, the income earned by an NRI outside India is tax free. However when your investments made in India start earning money in Inida, they are treated at par with resident Indians and taxed simiarly. Very nice article and it is timely for those who are in Tax planning. However I would like to add the following here. I think the amount paid towards EMI on Housing Loan is also deductable while making tax planning. 2) The house for which loan is taken and EMI is being paid is for self occupation only, unless the house is in another city/town. Thanks for your valuable 2 paise input. And, yeah… I also endorse your above added tax incentives towards housing loans.